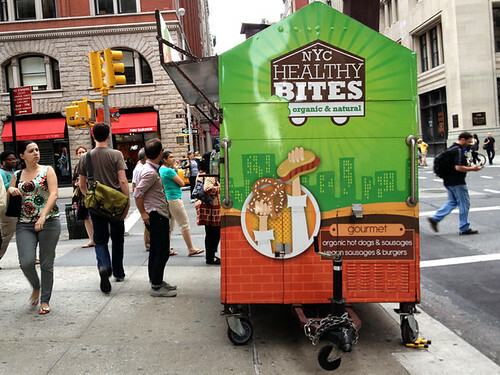 I’d seen this cute little food cart once before, outside the Union Square Barnes & Noble, but the other day when I was running errands in midtown and on my way to the Home Depot I finally ran into NYC Healthy Bites again, and had time to stop and order a burger. I got really excited to see vegan sausages on the menu – how unfair is it that there are so many hotdog carts in NYC but none of them serve veggie dogs?? I’m definitely going back to try one of the sausages. But today I was here for the burger! Intrigued as I was by the “Bollywood burger” on the menu, I was told they were out of that at the moment and only had the black bean burger. That’s okay though, I’m a huge fan of black bean burgers. 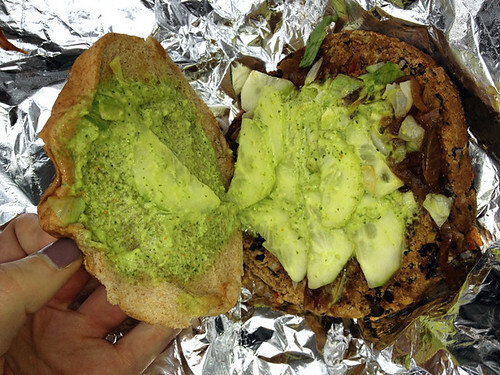 I picked my own toppings off of the menu – shredded lettuce, cucumber, caramelized onions, and a whole wheat bun. This combination equals an entirely vegan burger (yes, the buns are vegan too! This cart knows its vegan rules! ), but I was far too curious about the “spicy cilantro sauce” listed on the menu to pass that up, even though the guy who took my order made sure I was aware that it contained dairy (educated and conscientious, thumbs up!). My burger looked a bit sad and smushed when I sat down on a bench to open the foil wrapper – but don’t let that fool you. It still tasted delicious! 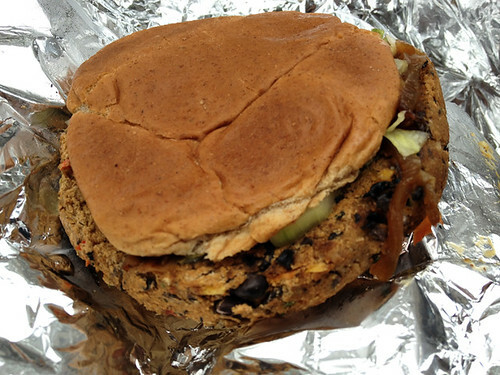 The patty was a classic black bean patty, with whole beans and chunks of other vegetables, slightly spicy. The bun was soft and fresh, but just a generic bun – nothing special (and admittedly a bit small for the size of the burger patty, which stuck out on all sides). But it was the toppings which really made this burger amazing for me – the sweetness of the caramelized onions and the spiciness of the cilantro sauce was just perfect. And the crisp coolness of the cucumbers and lettuce balanced it off nicely. 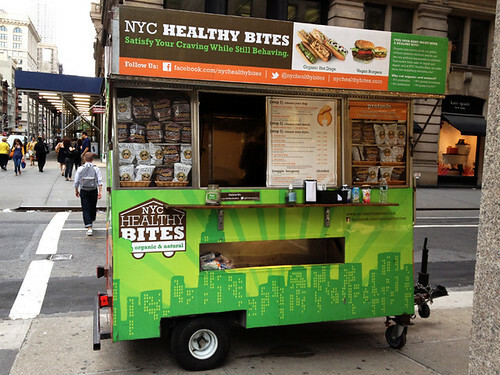 If you go to the NYC Healthy Bites cart, I’d definitely recommend ordering the spicy cilantro sauce and the caramelized onions! Unless you are vegan. In which case you should beg them to add a vegan version of the sauce to the menu. Because it was just that amazing. I can’t wait to come back to try one of the sausages next! They can keep anything with cilantro, but I'd be up for trying that burger- especially since they seem to know their "vegan". Those photos are stunning! Love your blog!